The historic Provo Tabernacle, as it looked before the Dec. 17, 2010 fire. (Wikipedia Commons photo) Rick Egan | The Salt Lake Tribune Julie Reneer sheds a tear as she watches the the Provo Tabernacle go down in flames, Friday, Dec. 17, 2010. Reneer, a native of Provo, has been attending church services in the building since she was a small child. The venerable Provo Tabernacle hosted everyone from a U.S. president to a Russian composer to myriad rosy-cheeked children in its long history at the center of Provo's cultural life. "It's truly tragic," said Bethany Patrick, who lives three blocks from the 112-year-old building that burned early Friday. She sang the Hallelujah Chorus there on Sunday along with other members of the Provo East Stake during its annual Christmas Music Fireside. A spokesman for the Church of Jesus Christ of Latter-day Saints said Friday that it's too soon to know whether the tabernacle is a total loss. But those who saw the damage were not optimistic. "It would be so tremendously expensive, I fear that it's almost an impossibility," said D. Robert Carter, a historian from Springville who first visited the tabernacle in the 1940s to sing in a Primary choir during an LDS Stake conference. Carter was nostalgic Friday after watching the last of the flames do their damage. "There won't be any more memories that happen there, is what saddens you," said Carter, who graduated with his Provo High Class at the tabernacle in 1957 and attended cultural events there as an adult. "It was really inspiring to go to Utah Symphony concerts on a fall afternoon," says Carter, "and see the light come through those stained glass windows on the west." LDS Church spokesman Scott Trotter said the building not only served church members and the community, but was "a reminder of the pioneering spirit that built Utah." Utah Sen. Orrin Hatch called it one of his favorite buildings. "The Provo Tabernacle was about more than mere bricks and mortar. It was an enduring symbol of the city and of the faith and fortitude of those early Utah pioneers," Hatch said in a statement. Kena Jo Mathews, chairperson of the Utah Valley Ministerial Association, called the tabernacle "the heart and soul of our community." In a written statement, she said the building "provided many opportunities for people of varying faiths to come together in celebration of religious freedom and love." Lost in the fire was an original 1934 Minerva Teichert painting that hung below the gallery, said Russell Bateman, a software writer who has performed many times with choirs in the tabernacle. He said he walked, dazed, around the building as it burned Friday. Bateman's affection for the building prompted him to create a website, http://www.provotabernacle.org, several years ago. Teichert's painting can be seen there. "If it were only a beautiful, historic old structure," said Bateman. "It's much, much more than that. It's part of the pioneering story, to say the least." In fact, the tabernacle was always a site for cultural events, even before it was finished, a process that took 13 years. Construction began in 1883 to replace a smaller tabernacle to the north, and in the summer of 1885, 2,000 people attended a memorial service there for U.S. President Ulysses S. Grant, Carter said. "There were temporary seats, no windows, no doors and no permanent floor," Carter said. It's perplexing, now, he said, to consider that event given the acrimony that then prevailed between the federal government and Mormon pioneers. 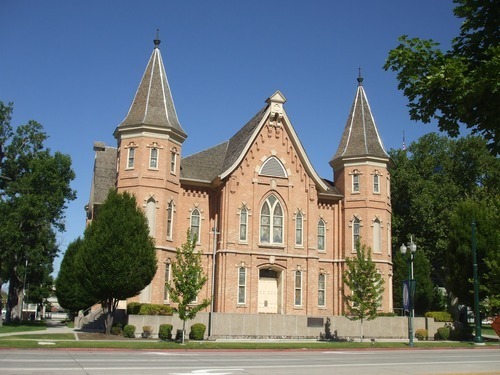 To escape government harassment over polygamy in Salt Lake City, the church's General Conferences in the fall of 1886 and the fall of 1887 were held in the unfinished Provo Tabernacle. It was completed in 1898 at a cost of $100,000. The architect was William Folsom, designer of a number of Utah's LDS tabernacles and temples. He patterned it after the Salt Lake Assembly Hall on Temple Square, although the Provo tabernacle is bigger and has four large octagonal staircase towers, one in each corner of the building. One of historian Carter's favorite stories entails the visit of early 20th century Russian composer and pianist Sergei Rachmaninoff, who performed in the tabernacle during an era when BYU brought a series of prominent musicians to the city. The Orem Electric Railroad ran next to the tabernacle and the depot was just to the west. "Right in the middle of his performance, it went through with bells clanging," said Carter. Some in the audience remembered Rachmaninoff suspending his hands above the keys; others recalled his hands resting in his lap. In any case, once the train passed, the concert resumed, Carter said. "I'm sure there have been hundreds, even thousands of unusual things like that." The tabernacle twice underwent major renovations twice. In 1917, a large cuppola was removed from the roof because it was causing it to sag. Frosted windows were replaced then with stained glass. In the 1980s, the tabernacle was closed for several years for major renovation. The original, historical look was restored with wood-grained faux paint on the banisters and other woodwork. The interior was repainted, windows were restored and the roof was reshingled. Doug Soelberg, of Architectural Art Glass, came to see the building where he restored the stained-glass windows. "We had the run of the building for the better part of a year," Soelberg said. "When the sun would set, [the windows] just glowed." In recent years, a number of stakes have held their twice yearly meetings in the tabernacle; none of the stake centers is large enough to accommodate the members, Patrick said. "I don't know what we'll do about that," she said. Provo Seventh-day Adventist Church Pastor Carlos Garcia and head elder Brad E. Walton offer the building and its community center for any meetings. "It was not only a beautiful, historic building, but a place where we were all part of a greater community," they said in a written statement.